Free motion not for you? How about some "forward motion" quilting with the walking foot? It's time to get that walking foot out of the ditch, take it for a drive and see what that baby can really do! 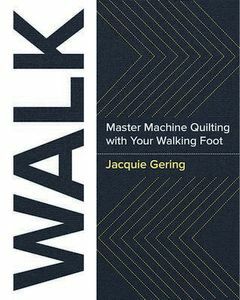 Jacquie Gering will be your guide as you work your way from walking foot basics to intricate marked designs as you master machine quilting with your walking foot quilting basics that provide a solid foundation for quilting with ease, quality and creativity. She guides you through a series of test drives with your walking foot, allowing you to get acquainted with its features and set yourself up for success with your foot and your machine. Then you'll learn how to prepare and mark the quilt, prevent puckers while quilting, and manage large projects. Jacquie teaches over forty walking foot friendly designs including channel quilting, matchstick quilting and quilting with decorative stitches. Thought that your walking foot could only be used for straight line quilting? Learn to use the walking foot with traditional designs including cables, clamshells, and orange peels or finish your quilt with intricate point to point designs like the boomerang and nested diamonds. Quilt graphic, innovative radiating designs. Learn to spiral and quilt concentric designs or use your newly developed skills to quilt unique designs with reserve. You too can achieve the textures shared in Jacquie's vibrant, graphic quilts. With a toolbox of simple to complex designs you'll have the options you need to quilt on your home machine with designs that will support your piecing and create a harmonious marriage of piecing and quilting. With a walking foot, you'll find a level of control and success you never thought possible and you'll become as excited about the quilting as you are about your piecing.